City Connect » Culture & Lifestyle » What A Cheek! 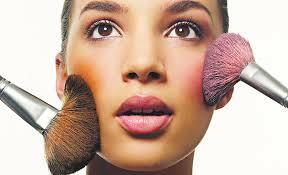 Do you know that blusher is the most versatile product in your make-up bag. Don’t just use it on your cheeks though, there are plenty of ways you can lift your looks with artful brush strokes. Powder is by far the most popular type of blusher today as it suits all skin types, but is especially good for oily skins, helping to preserve a good matt finish. Dust it on your face with a thick brush after powdering, not straight on top of moisturiser as this tends to make it look caked and blotchy. Cream is especially good for dry skin and gives it a healthy glow. Use on top of foundation but before powdering. Apply with a damp sponge for best results. Gel helps to give your skin a sheer transparent sheen. Most gels are waterproof so they are great for swimmers and sunbathers. Use just a dab on top of moisturiser and blend well with your fingertips for soft, long lasting colour. When it comes to application use a soft fluffy brush to put on your powder blusher. The bigger the brush, the softer the effect. Always tap off any excess colour on the back of your hand before you start – begin with very little colour and gradually build it up – it is easier than having to wipe it off and starting again if you put on too much. Use dabbing rather than stroking movements so you do not end up with theatrical-looking stripes across your face! Professionals like to use two brushes, one to put the colour on and one for blending, to give a cover girl finish. Wash brushes frequently, as they collect dust and bacteria that can cause acne. Leave brushes to dry flat rather than standing them upright so the bristles do not splay out and lose their shape. With cream and gel blushers use dampened cosmetic sponges for a really even, natural finish and to stop it getting on your fingers. Put a few small dots on your cheeks and blend away! Blusher is not just for your cheeks but can also be used to give your face a touch of healthy colour too. Try it over your eyelids and brow bones but stick to soft matt shades for daytime make-up. Across the bridge of your nose for a sun kissed look-but keep it light or you may end up looking sunburnt. On the tip of your chin-this helps to shorten a long face. If you have a round face you can slim down your face with a concentration of colour on the cheekbones, fading out at the temples. Check your profile carefully in the mirror for any hard edges on the sides of your cheeks, then blend them in with a brush. For those of you with an oval face add colour to the fullest part of your cheeks. Smile with your mouth closed to find the right starting point. When mixing shades for your cheeks, stick to the same textures-powder with powder or gel with gel. If you have a square face add colour just below the cheekbone and blend outwards, then stroke the same colour along your jawline to soften it. Do not forget to check the finished look with your hair styled in place. You may need to re-shade to balance the look. And finally if you have a long face apply a dark matt blusher on the tip of your chin to give the illusion of a shorter face. Always use the lightest touch and brush outwards and downwards to prevent any fine facial hairs from sticking up. Q. My blusher always fades away leaving me looking pale. What can I do to make it last longer? A. Try layering the colour by using a cream blusher first, then dusting a powder blusher over the top of your make-up once you have powdered your face. Q. Blusher makes me look flushed. What am I doing wrong? A. It may be the shade that you are using, the amount you are putting on or where you are applying it! Q. Sometimes when I am in a hurry, I put on too much blusher. How can I correct this? A. Powder blush can be toned down with a little light face powder. Dust it over the top with a brush. With cream or gel, just smooth foundation over the top. Neon Nails & Blue Mascara? Yes, You Can! Tagged blusher, makeup. Bookmark the permalink.